If you have a project to share please do so here! So I have decided use my Library Orientation as my first project. My middle schoolers are 1:1 iPads so they will be my trial classes to see how it works since they come with the technology in hand. The objective of the class will be a scavenger hunt. They will work in teams which I will assign (since their will be new students to each grade in September it will be a great way to add in some "get to know each other" time and there will be someone in each group already familiar with the library). When they arrive at the library, there will be a QR code on the door which will take them to a video of me describing their challenge and instruct them to go to my wiki (there will also be a QR code in the door for that). On the wiki will be: the group listings, written instructions, and the first clue. The first clue will be to a book in the nonfiction section. The clue to the next clue will be in the book. That will take them to a poster about researching with primary sources. On the poster will be the next clue which will take them to the library catalog. The answer they find using that catalog will lead them to the nonfiction section of the library. In that section they will find another QR code. The QR code website will lead them to the fiction section where they will be required to choose and check out a book. The first group finished wins a prize (not sure what yet). I will do a short reflection with them at the end. Questions: Does this sound like it will be enough for a 40-50 minute class? I think this will be fun. I also plan on developing other projects on primary sources and maybe low tech no tech versions of this for lower school. I want to thank everyone for working on/ participating in this MOOC! It has been great and I have learned so much. Okay - my question is will there be a facilitator or teacher there. Or is it more that we will need to figure it out everything for themselves? Narrative: "The ability to travel time is inevitable...just as Virgin Airlines has planned for the first space-flight, so too, will travel in history become a recreational passtime in the future. For the next 5 weeks, you must go through training in order to work towards becoming Time Traveler Certified." Rationale: Since I have limited time with these particular students and they are used to class a certain way, the introduction of a wide variety of sources or massively altering what materials students interact with is out of the question. Thus, this game is based on the material from a single chapter in the students' textbook, with a few novel features that should hook them for the last month of school. Class levels 1 through 4 will each follow the same game premise, but their assignments differ according to text's material. Research: Aside from Tom Chatfield's "boxes" and rewarding the brain, I am grounding this game in differentiated instruction principles outlined in Deborah Blaz's book. 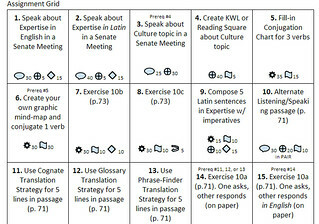 The Assignment Grid is a classic example of offering students some choice in their learning by providing options that accomplish similar goals. For instance, the first three assignments deal with public speaking, while assignments 11 - 13 all deal with translating. 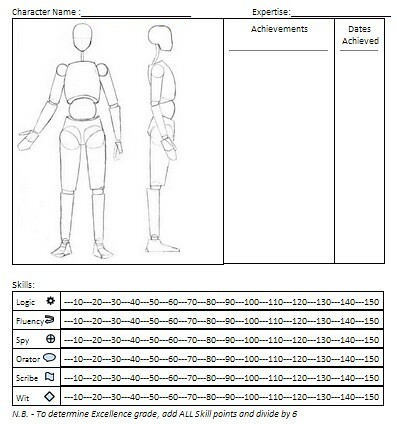 Mechanics: Each assignment on the grid awards skill points based on real-world skills (Logic = Grammar, Wit = Vocabulary, Scribe = Writing, etc...). With six skills and a choice of different assignments, roughly 10 completed assignments earns a B. While a few minutes of class time is devoted to direct instruction on certain grammar and cultural points, students are given the remainder of class as well as out of class time (homework) to complete assignments. Students choose an Expertise (WoW profession) about which to research, speak, and compose brief sentences. Assessment: Formative includes review of completed assignments (checked daily by me stamping their Assignment Grid), Summative are 3 letter grades - Excellence (based on all skill points added and divided by 6), and Growth/Effort grades based on self-assessed (checked by me) holistic rubrics given at the game's end. Rewards: Achievements based on assignment completion, such as completing all of the Speaking at the Senate assignments. Achievements earned will be announced each week on my teacher site (Character names), and administrators will be invited to the weekly (Fridays) Senate meeting (desks arranged in a half-moon w/ speakers/performers) to hear Expertise talks in both English and Latin, and thoughts on the cultural topic in the text. Answer: Yes I will be there to facilitate, take care of any issues that arise. And addition- I can use Aurasma because I finally have a studio account so some of the QR codes can be made into videos from an Aurasma overlay! MagisterP great project. Very involved and well thought out! Lleshrad, the library treasure hunt sounds like a really good alternative to having you lead a library tour. I love the idea of putting new students on teams with old ones. Does your library offer any other resources for them to explore besides books? If so, I'd consider adding one or two more steps in order to be sure you have enough to fill up 30-40 minutes. I'd be careful about offering a prize for the first team to finish - that may encourage people to just whip through it as fast as possible. It also gives a decided advantage to any students who've already used the library and remember what they learned earlier. What will the first teams to finish do while the others are still working through the quest? Maybe you could have them do silent reading in the book they checked out - tho it may be a bit hard for them to settle down after running all over the library. All in all, it sounds like a lot of fun - far more interesting than a traditional library tour with you talking and them listening. Thanks for the feedback! I will think about it all and incorporate it. Maybe I will add a clues about finding the places new books are showcased, the bulletin board where notices are placed, and sign ups for book club & programs/ contests.